Get Ready to Read More in May! 30 dangerous paths. 1 brave reader. 30 minutes to escape. YOU CHOOSE THE PATH TO SURVIVE! You are strapped tightly into your seat on the bullet train. The mountain track is so steep, the aisle is a staircase. As the train accelerates at top speed, a passenger slips out of his seat and begins to fall to the back of the train. He will probably die. Do you unstrap yourself to save him, or do you stay in your seat? 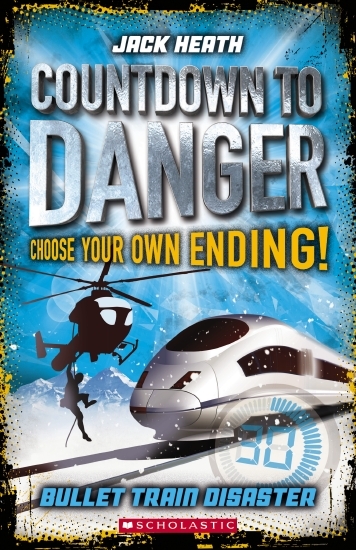 Countdown the minutes in Jack Heath’s terrifying story of your survival–or your demise! You decide. Read the story in real time! 30 minutes to survive, in 30 minutes* of reading time! *Based on average reading speed. Jack Heath is the best-selling author of more than 20 action-packed books for kids aged 6-14. He fell in love with books in primary school, when an ear infection left him unable to do much other than read. In high school he was frustrated by the slow pace and lack of excitement in most teenage fiction, so he started writing his own novel. It was picked out of a slush pile and published while he was still a teenager, and it soon became an international success. Since then Jack's work has been translated into several languages, shortlisted for many awards and optioned for film and television. His novels—and his enthusiastic presentations at schools and festivals—have gotten thousands of kids hooked on reading. In the course of his research, Jack has toured morgues and prisons, performed as a street magician and travelled through 11 countries, including Russia. His previous day jobs—in which he met many interesting characters—include fry cook, music teacher, TV salesman, call centre worker and most fun of all, bookseller. He lives on the land of the Ngunnawal people in Canberra, Australia. ™ Copyright Scholastic Australia 2015 All Rights Reserved.